Observations of financial markets have shown that while many financial risk models rely on the assumption of normal return distributions, financial instruments can exhibit extremely non-normal behavior, even in supposedly calm markets. The relevance of new measures for market calmness, or lack thereof, is emerging as we see the new “normal” regime turning more to increased market volatility and turbulence. It is no longer enough to only capture volatility within risk modeling, but rather, risk modeling needs to capture market turbulence, which is loosely defined as the volatility of volatility. This market turbulence can be measured by tail-fatness in the behavior of asset returns. In order to properly adjust for market turbulence in our estimates of portfolio and asset risk, we can leverage a fat-tailed approach to modeling the factors that form the framework of risk models. By doing this, the risk models will better capture the empirical behavior of factors and financial instruments, as well as properly assign realistic probabilities to extreme events. Volatility Clustering: volatility comes in clusters, with periods of high volatility persisting and similarly periods of low volatility persisting. This implies that realized volatility has an impact on future volatility. Asymmetry of Returns: in return space, negative events tend to be much more pronounced, especially in equity markets, than upside events. Extreme Events: extreme events occur outside the realm of “normal” market behavior. This means normal assumptions will assign unrealistically low probabilities to extreme events, especially during times of market duress. 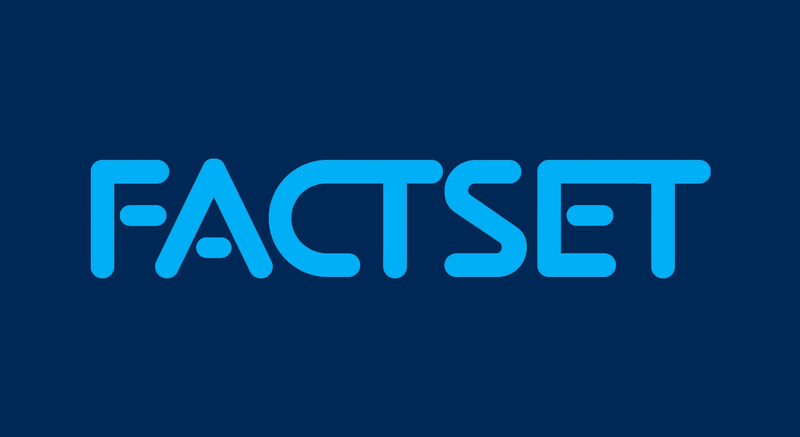 FactSet’s Fat-Tail Multi-Asset Class (Fat Tail MAC) Risk model leverages the factor structure of the standard FactSet Multi-Asset Class Risk model and allows each risk factor to follow a dynamic fat-tailed distribution. The Fat Tail framework incorporates three main components designed to address the phenomena mentioned above. The first component is the methodology used to estimate factor volatility. We leverage an equal weighted moving average (EWMA) with a classical tempered stable distribution to model volatility. This method does particularly well at capturing the phenomena of volatility clustering. Figure 1 shows the behavior of volatility, which tends to come in clusters. We see that periods of high volatility are followed by subsequent periods of high volatility and periods of low volatility are followed by subsequent periods of low volatility. The second component is the marginal distribution model used for factor returns. This accounts for a more philosophical observation that financial markets tend to follow a time scale different from our physical time. For example, when there is an increased level of news and activity in the markets, market time appears to move faster relative to a single unit of our physical time; we can compare this to times when news and market events are sparse, and we observe market time to move slower. The speed of market time, described as market time intensity, can be quantified into a scaling factor, which when applied to the factor returns during the scenario generation process, has an implication on the factor returns distributions. The resulting distribution is more peaked around the center of the distribution and exhibits fatter tails to represent the more realistic probabilities of extreme events, as illustrated in Figure 2. However, this distribution also exhibits flexibility and converges to the Gaussian model during calm markets, which is key to avoiding over-penalization of risk budget during such times. The third component describes the dependence structure between risk factors within the model. This is an extremely significant and key component, as improper modeling of this dependence structure can have dangerous implications on estimation of portfolio diversification. Models that do not properly account for joint tail dependence will incorrectly identify a gain in diversification benefit across factors exactly during the times when correlations move to 1 and all diversification goes away. Performing risk analysis or portfolio construction under such assumptions can result in catastrophic losses for the portfolio, analogous to what was experienced during the global financial crisis where models were not accounting for the joint tail distribution across assets in factors in a realistic fashion. The model chosen for the Fat Tail MAC model is an extended asymmetric version of the T-copula. In addition to the traditional correlation matrix it adds parameters that govern asymmetry and dependence in the tails. This model does an exceptional job of describing increasing correlations during market stress. Figure 3 shows factor correlations estimated using different models, with the upper right of the matrix showing the difference between Gaussian correlations vs. empirical correlations and the lower left of the matrix showing difference between asymmetric T-copula correlations vs. empirical correlations. We can see that the asymmetric T-copula exhibits much smaller differences, implying that this structure produces estimates which are much closer to the empirically observed joint probabilities. In addition to capturing the phenomena described above, the fat-tailed approach has explicit benefits which are pertinent to risk and portfolio management. Due to the model’s increased responsiveness to market turbulence, we see large improvements in model backtests and VaR exceedances. This has positive implications for regulatory purposes as well as for compliance purposes. Because the model is able to capture asymmetry of distributions, we can incorporate realistic probabilities for extreme downside events, and also measure upside potential. The measurement of a portfolio’s upside potential relative to the downside risk is extremely useful in determining opportune times to take more risk in the portfolio. 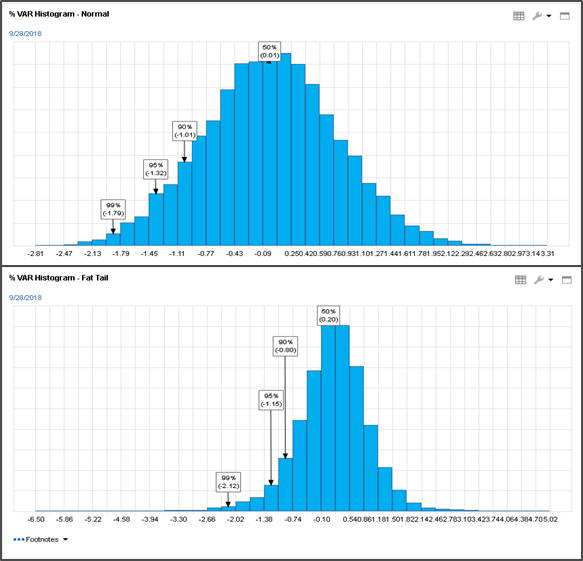 Lastly, we can use the estimates derived from the fat-tail approach to avoid over-penalization of risk during calm markets, given that the model will react to the lack of market turbulence and converge to a normal distribution during calm periods. This characteristic is ideal for portfolio management that incorporates risk budgeting and better align a portfolio manager’s convictions with the market environment. Before we delve into the asset allocation application, we first need to define two indicators. The first indicator is the VaR Tail indicator. Figure 4 shows value at risk (VaR) at the 99% confidence interval for the S&P 500 over a 10 year period, using both the normal MAC Risk model and the Fat Tail MAC Risk model. The VaR Tail Indicator is represented by the difference between these two VaR estimates. As demonstrated by Figure 4, this measure can act as an indication of turbulent markets, with the indicator increasing sharply above 1 going into tumultuous periods. We see the indicator is extremely sharp for severe crisis periods (i.e. the 2008 global financial crisis), and even picks up on less severe market unrest (i.e. 2012 U.S. debt downgrade, 2015 oil run, or China market volatility). As the market calms again, the indicator approaches 0, implying that the fat-tail model is converging to the normal model. The intuition follows that the more responsive fat-tail model, which incorporates more information about the market, will react to market conditions sooner than the normal model. An indicator such as the VaR Tail Indicator can give investors insight into the current market environment and even have predictive power on subsequent market conditions after a crisis. The second indicator to be used is the upside vs. downside potential ratio, defined as the 1% value at risk divided by the 99% value at risk. This will produce a ratio that will fluctuate across time based on the market regime. Figure 5 shows this ratio for the S&P 500 for a 10 year period, estimated using the normal MAC Risk model and the Fat Tail MAC Risk model. A ratio value greater than 1 implies that there is higher upside potential in the portfolio as compared to downside risk and intuitively it may be an opportune time to invest in riskier assets for which there is conviction to benefit from the potentially large positive pay-offs. Conversely, a ratio less than 1 implies that the downside risk outweighs the upside potential and it may be more prudent to tilt towards safer assets. Because the normal MAC model assumes normally distributed factor returns for equities, there is very little asymmetry captured in the VaR estimates and subsequently this ratio is very close to 1 throughout the 10 year period. In contrast, the Fat Tail MAC Risk model does capture asymmetry in the simulated return distribution and as such, we are able to see the true fluctuation in upside and downside potential that exists in equity markets over time reflected in the estimated ratio using the fat-tailed approach. To demonstrate the applications of fat-tail modeling for asset allocation, we ran an experiment incorporating one of the indicators outlined above, the upside vs downside potential ratio. The experiment emulate a very broad and classic asset allocation decision, how do we efficiently allocate between equities and fixed income, with the allocation to equities and fixed income represented by the S&P 500 and Bloomberg Barclays US Aggregate, respectively. We tested an over- and under-weight to equities relative to three static portfolios representing a 50/50, 40/60, and 60/40 to equity and fixed income. The allocations of these static portfolios were varied over time according to a rules based approach which over-weights equities when the upside vs downside potential ratio, estimated using the Fat Tail MAC model, was greater than 1 and under-weights equities when this ratio was less than 1. These dynamic portfolios are referred to as VaR-adjusted portfolios. This approach was simulated over a 10 year period from June 2008 to August 2018, with the allocation rebalanced monthly. Figures 6 and 7 show the results from the asset allocation exercise. In all cases, we see that the dynamic VaR-adjusted portfolios had higher returns, both annualized and cumulative, lower volatility, and higher Sharpe ratios. In some cases, the improved annualized return was substantial, ranging from 20-45 bps higher in the 4 year period following the global financial crisis and 10-20 bps higher throughout the entire 10 year period. One might argue that the examples are narrowly focused on the U.S. investment universe for equities and fixed income and specifically, large cap for equities, which could skew the results; however, due to the model’s sensitivity to market mispricing and volatility, the signal derived here would likely be even stronger within small cap or international universes. It is clear that the fat-tail risk modeling approach, as well as the consideration of relevant risk indicators, can enhance the asset allocation process and produce more efficient portfolios. We also looked to test the efficacy of fat-tail modeling within the asset selection process. Here, we constructed one set of “risky” portfolios and one set of “safe” portfolios. The risky portfolio was derived using the top 50 securities within the S&P 500 by marginal VaR. Similarly, the safe portfolio was derived using the bottom 50 securities within the S&P 500 by marginal VaR. Each set of portfolios was constructed using VaRs estimated with the both the normal MAC Risk model and the Fat Tail MAC Risk model, resulting in four total portfolios (1 risky, normal portfolio, 1 risky fat-tail portfolio, 1 safe normal portfolio, 1 safe fat-tail portfolio). The weights for the assets in the portfolios were held proportional to the asset’s weight in the S&P 500. The portfolios were rebalanced monthly over a 10 year period from June 2008 to August 2018. Figure 8 shows the results from this asset selection exercise. For both the four year period following the financial crisis and the full 10 year period, we see higher Sharpe ratios for the fat-tail portfolios relative to the normal portfolios. 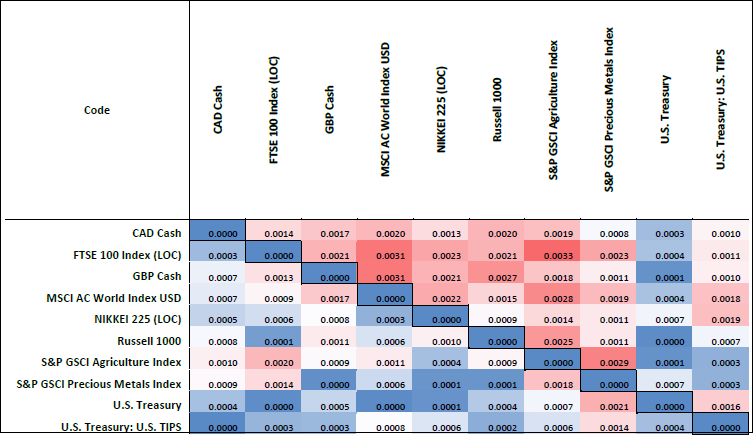 In some cases, we see that the annualized returns for the fat-tail model are over 100 bps higher, as is the case with the safe portfolio during the June 2008 to June 2012 period and the risky portfolio during the full 10 year period. Similar to what we saw with the asset allocation example, there is evidence of the benefits of incorporating risk adjusted views into the asset selection process, with the fat-tail approach augmenting these benefits even further. We’ve demonstrated throughout this article the various ways that the fat-tail approach to multi-asset class risk modeling can allow for increased accuracy in risk estimation and decomposition. Moreover, there are major implications on risk management and portfolio construction processes. While the examples here relate heavily to tactical portfolio construction decisions, areas of future research and model expansion will allow for innovation of models that incorporate extremely long horizons (i.e. 5-10 years or more) along with the fat-tail approach, which can clearly have applications to strategic portfolio construction decisions. Additional planned enhancements to the model structure include customization of the EWMA volatility estimator and options for dynamic GARCH(1,1) to further improve the estimation of risk and allow portfolio and risk managers to fine tune risk analysis for specific portfolio strategies. Regardless of whether one is concerned with asset allocation, asset selection, or simply enhanced estimation of portfolio risk and drivers of risk, the fat-tail approach to modeling market risk can greatly improve processes around risk management and portfolio construction. 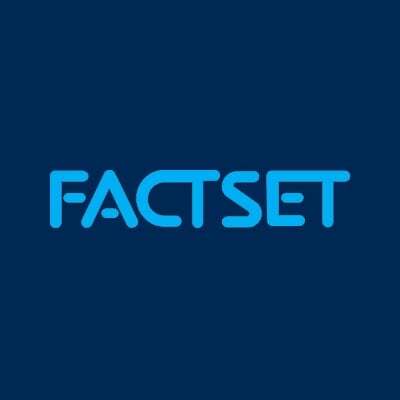 Alyx Flournoy has been with FactSet since 2011 and is based in New York City.